A dead man in the cemetery, another in the bakery. Ellen McKenzie has to find the killer soon … before another death puts a stop to her wedding. The groom is Dan Dunham, Santa Louisa’s Chief of Police. The guest list is growing and Ellen’s dreams of a small, intimate candlelight ceremony are rapidly disappearing. A major distraction is Ellen’s quest to find a new building for Grace House, a halfway house for needy women. Then she finds old Dr. Sadler dead in the cemetery, his head bashed in by the arm of a marble angel. Every suspect is connected to Grace House. After it goes up in flames, all the residents, including one new-born, move in with Ellen and Dan. 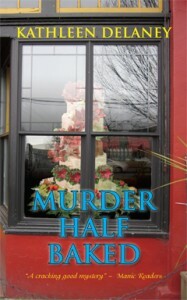 Will Ellen and Dan ever solve the murders and get their lives back? Kathleen Delaney, a retired real estate broker, has authored three other Ellen McKenzie mystery novels, using her real estate experience to guide Ellen. The scenes in the bakery kitchen required extra research, including taste tests. Besides her novels, Kathleen has contributed to several anthologies, won a national award for short fiction, and published several articles. She lives in a century-old house in South Carolina, enjoying her two dogs and eight grandchildren. For more information, go to KathleenDelaney.net. I was so deep in thought that I almost didn’t see her. The old woman was at the cemetery gates, waving her arms, staggering to keep upright. I braked and backed up. “What’s the matter?” I got to her just as she collapsed. Her face was gray, her breathing coming in labored gasps. I looked up the drive. What was she talking about? They were all dead. Weren’t they? Doctor Sadler? Up there? Blood? Why would he be … no. This couldn’t be happening. I looked down at the frail little thing. Her breathing seemed a little better, but her color was still terrible. Shock. She was in shock. I couldn’t remember what you did for shock, but I knew there was something. Mouth to mouth? No. Lie her down flat? Elevate her feet? “I am. Just sit back and try to relax.” I wanted to sound soothing. Instead I sounded as unnerved as she. “Where did you say he is? If he’s hurt … I have my cell phone.” I wasn’t at all sure what this frail little woman had seen, but it was certainly possible Doctor Sadler, or someone, had had an accident and needed help. However, I wasn’t so unnerved that I was going to call anyone before I knew what I was calling about. I followed her directions and drove into a parking area that contained only one very old, very large car. Its back passenger door was open, and a mat lay on the gravel. “Up there.” She pointed up a path that wound peacefully between old monuments. A huge oak reigned sedately at the top of the rise. The dead slept here, but in peace and tranquility. Violence and blood seemed to have no place. I started up the small hill, convincing myself with every step that there was nothing to find. I was wrong. At least I knew enough not to go too close. In any event, it wasn’t necessary. Even at a distance, I could tell that the elderly man who lay across the grave would soon be in one of his own. I felt my knees give way and came to rest on a fat marble bench at the foot of a grave. I didn’t know whose it was but sent him or her a thank you anyway. It took a little fumbling before I was able to get my cell phone out of my pocket and another minute before my fingers would dial 911. My eyes never left the body. I don’t know if I thought I could will him to move, or what, but I couldn’t seem to see anything else. I wasn’t fine. Not one bit. I’d seen dead people before, but this! My head was swimming, and Ida’s advice seemed pretty good. At least I wouldn’t have to look at what remained of what I supposed was Dr. Sadler. Sirens. Screaming loudly and getting closer. Help was on the way. I couldn’t see the front gates from where I sat, but I could see the road. It filled up fast with police cars, fire trucks, and an ambulance. I rose to my feet, vowing I wouldn’t get sick on what might be crime scene grass, and walked down the trail toward the parking lot. Two black and whites pulled into the lot, followed by an ambulance. My friend Gary was in the first car. Before I answered him, I glanced over at my car. My old lady seemed to be leaning back against the seat, her mouth hanging open. Wonderful. She was probably having a stroke or something. No. Her color looked okay. But coffee might help. It would sure help me. I climbed into the driver’s seat and leaned over my passenger, prepared to do whatever was necessary to help this sweet, helpless old lady. I hoped that didn’t include a mad dash to the emergency room. Gary took off, fast. I didn’t know if he went for water or just to get out of there. I could hardly blame him. I wondered if she was always like this, or if shock had made her irritable. I quit wondering. What a lovely day this was turning out to be. First my wedding cake was about to grow bright red poinsettias, then all the drama at Grace House, a corpse in the cemetery, and as an added extra bonus, I was sitting next to one of the most foul tempered old ladies I’d ever come up against.